Air pollution is the single most important issue that will be decided by the London Mayoral elections whether people realise it or not. That’s because it is the biggest issue that affects every Londoner and over which the Mayor has the greatest control i.e. unlike housing or the economy. In particular, the Mayor has complete control over transport emissions which are the biggest single source of air pollution within London Note 4. All the UK’s most polluted roads are in London. Clean Air in London (CAL) has used powerful European access to environmental information laws to reveal that the Government expects 352 road links in the UK to breach the UK and European legal limit for annual mean concentrations of nitrogen dioxide (NO2) in 2020. 41 of these locations are still expected to be breaching the legal limit in 2025.
giving a 100% discount to newer diesel vehicles emitting less than 99 g/km of CO2. Almost all these measures have benefited car drivers at the expense of others. Perhaps most shocking, CAL found Boris Johnson guilty of ‘public health fraud on an industrial scale’ for spraying ‘glue’ in front of the air quality monitors most-used to report legal breaches and warn the public of air pollution episodes in the months leading up to the London 2012 Olympics. After years of failures and backward steps on air pollution, Boris Johnson has proposed a so-called Ultra Low Emission Zone (ULEZ) that is too small, too weak and too late. It will impose a modest daily charge on the oldest diesel vehicles entering the central congestion charging zone from September 2020. A ‘show of hands’ at a large stakeholder event organised by Transport for London in late 2013 revealed that not one person present considered the scheme ambitious. A freedom of information request to Transport for London revealed that diesel vehicles are responsible for 90% to 95% of NO2 exhaust emissions in London Note 3. Separately, Boris Johnson’s response to a European-wide survey of action by cities revealed in 2013 that 56% of fine particles (PM2.5) and 63% of oxides of nitrogen (NOx) emitted in London in 2015 would be caused by road transport Note 4. Of those transport emissions 54% of PM2.5, 47% of NO2 and 28% of NOx emissions were estimated to come from passenger cars including private hire vehicles. It is vital therefore that the ULEZ is made bigger, stronger and smarter before 2020 with an intermediate step by May 2018. Paris and other cities are taking similar action now. All the leading candidates for Mayor of London, except Zac Goldsmith would make the ULEZ bigger and implement it ‘sooner’. Sian Berry and Caroline Pidgeon have also pledged to make it stronger and smarter. CAL has analysed the leading Mayoral candidates’ manifestos and/or contacted them or their teams to produce ‘Clean Air Scores’ Note 1. These scores are brutal, transparent and fair by focussing on the most important sources of air pollution and the solutions where the Mayor has the greatest possible control over the outcome. They ignore, for example, calls by candidates for a Government funded scrappage scheme for diesel vehicles. Candidates hit the jackpot with two extra points if they back CAL’s full manifesto Note 1 which contains many other important but ‘second order’ measures e.g. relating to taxis and PHVs. 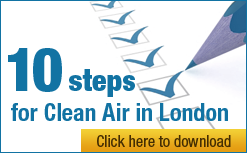 Final Clean Air Scores revealed today are: Sian Berry ‘Perfect 10/10’; Caroline Pidgeon 8/10; Sadiq Khan 6.25/10; and Zac Goldsmith 4/10. CAL has modelled the Government’s latest baseline data and found 352 places across the whole of London expected to breach World Health Organisation guidelines and legal limits for nitrogen dioxide (NO2) still in 2020 with 41 of these still breaching in 2025. The only subsequent measure proposed by Boris Johnson to address this catastrophe is his so-called ULEZ which is too small, too weak and too late in September 2020. Worse, it will cover only a tiny fraction of these breaches and worsen many of them along boundary roads such as Euston Road, Grosvenor Place, Knightsbridge, Marylebone Road and Upper and Lower Thames Street. This new data reminds us of the conveniently optimistic projections used by the Government to defend its court case against ClientEarth which do not assume the full horror of real world vehicle emission failings compared to test standards. “Clean Air in London (CAL) has campaigned for many months for the Mayoral candidates to take action on the biggest levers in the fight against air pollution. We have been largely successful with one notable exception. “We have singularly failed to persuade Zac Goldsmith to take urgent action to reduce diesel pollution from cars and other vehicles. We are therefore taking the unprecedented step of asking people not to vote for Zac Goldsmith in the London Mayoral election. Zac, a famous environmentalist, seems constrained by ‘car is king’ Conservatives who have dominated Boris Johnson’s time in office. “Eliminating carcinogenic diesel exhaust is the single most important issue where the Mayor has the greatest possible control. In reality, the Mayor has 100% control of transport emissions and costs and little else. “All the leading Mayoral candidates other than Zac Goldsmith have pledged to consult on implementing a bigger Ultra Low Emission Zone (ULEZ) ‘sooner’ than planned by Boris Johnson for September 2020. The new NO2 data highlights the folly of Zac Goldsmith being the only leading candidate not to propose a bigger ULEZ ‘sooner’. There is a wide gulf between Zac and all the other leading Mayoral candidates on the most significant issue for the London Mayoral election. “Not only can’t we wait four and a half years to begin restrictions on diesel cars, which would be similar to those that Berlin introduced in January 2010, but the timing means that we’d still need to be campaigning in four years’ time for the same scheme to be implemented by the next Mayor. That is unacceptable. “We congratulate Sian Berry and Caroline Pidgeon and thank Sadiq Khan for their commitment to a more ambitious ULEZ ‘sooner’. CAL is grateful to George Galloway also for his commitment to action on diesel fumes ‘sooner’ than Zac proposes. Sophie Walker and Peter Whittle have also made powerful statements on clean air. Defra’s ‘Latest measurement summary map’ shows the rolling 24-hour picture whereas the London Air bulletins are reset at midnight so usually show LOW until lunchtime even during an episode. Both Defra and London Air show current air pollution levels relative to alert levels which are very different from day to day health risks and annual mean legal limits which are much lower.